For professional photographers and other creatives who require tabloid-size scanning or need to archive their work via slide and negative batch-scanning, Epson has introduced the Expression® 12000XL large-format color flatbed scanner in two models. The Expression 12000XL-PH is designed for photographers and film preservationists, while the Expression 12000XL-GA is designed for professional graphic artists, museums and forensic labs. Both units allow scanning up to 12.2 x 17.2 inches with 2400 x 4800 dpi resolution. Available now, the Expression 12000XL-GA is priced at $2,895 and the Expression 12000XL-PH, at $3,429. LONG BEACH, Calif. – Jan. 24, 2017 – Underscoring the company’s leading position in the photo scanning market, Epson America, Inc. today announced the Epson Expression® 12000XL large-format color flatbed scanner. The Expression 12000XL offers professional-quality, tabloid-size scanning with the latest imaging technology in two configurations – the Expression 12000XL-GA designed for professional graphic artists, museums, and forensic labs, and the Expression 12000XL-PH designed for photographers and film preservationists. 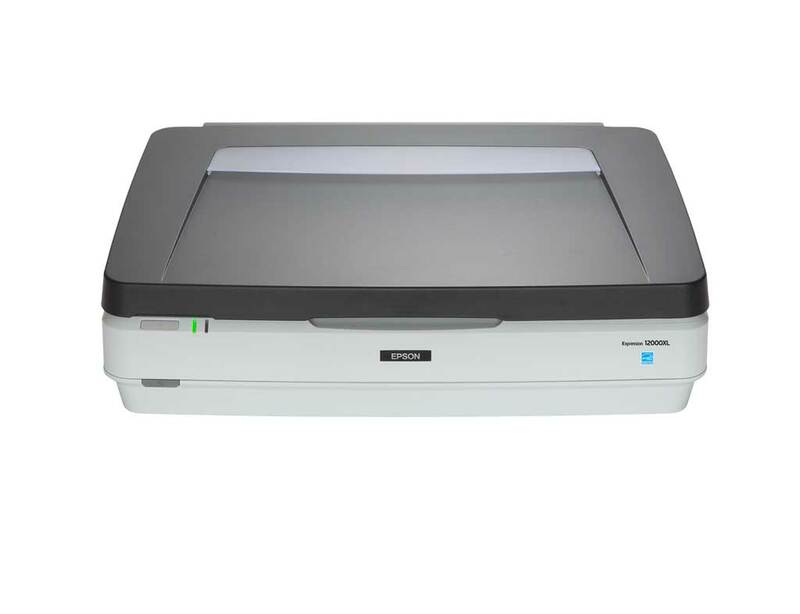 Delivering large-format scanning up to 12.2″ x 17.2″ with 2400 x 4800 dpi resolution, these graphic arts and photo scanners are ideal for commercial art, scientific and engineering applications. The Expression 12000XL leverages exclusive ColorTrueTM II imaging system that combines superior processing, a fast warm-up LED lamp, and Epson MatrixCCD® technology for enhanced colors and pinpoint registration. It can scan an 8.5” x 11” color image as fast as 23 seconds at 300 dpi, and a 35mm slide as fast as 51 seconds at 2400 dpi. Leveraging Epson Easy Photo Fix® technology, the large-format scanner offers one-touch restoration for faded color photos, plus automatic dust removal and grain reduction. The Unique AutoFocus optics ensure optimal focusing on an original image, up to 6mm above the scanner glass, ideal for scanning 3D items and transparencies. Enhanced with new features, the 12000XL features a fast warm-up LED lamp for 30 percent less power consumption, a display Gamma of 2.2 and sRGB color space for improved image correction, as well as an overall improved scanner driver for faster and easier usability. Subject to terms and conditions, for more information, please visit https://epson.com/support. The Expression 12000XL-GA ($2,895 MSRP) and Expression 12000XL-PH ($3,429 MSRP) are now available for purchase through authorized Epson resellers, select retail locations, and on the Epson store (www.epsonstore.com). Both scanners come with Epson’s top-of-the-line service and support, including a one-year limited warranty. The Epson 1-Year High-End Business Scanner Service Plan ($525.95 MSRP) is available as a service extension option. Users can purchase up to four additional years per unit for up to five years of coverage. Note: Epson, Easy Photo Fix, Epson MatrixCCD and Expression are registered trademarks, Epson Exceed Your Vision is a registered logomark of Seiko Epson Corporation. ColorTrue and Micro Step Drive are trademarks of Epson America, Inc. Mac is a trademark of Apple Inc., registered in the U.S. and other countries. All other product and brand names are trademarks and/or registered trademarks of their respective companies. Epson disclaims any and all rights in these marks. Copyright 2016 Epson America, Inc.